The odds for a farm bill in 2018 have improved considerably. On Wednesday, the Senate Ag Committee moved its version of a farm bill with a strong bipartisan vote (20 to 1) (Senate Ag Committee, 2018 Farm Bill; Farm Policy News, June 13, 2018). House leadership is attempting to resolve the immigration issue that contributed to the House Ag Committee’s farm bill defeat on the floor. This may pave the way for a House vote reconsidering the farm bill, but success remains uncertain. 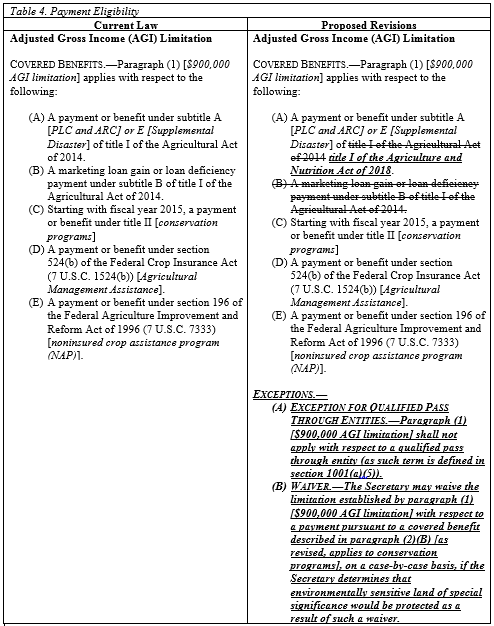 Among the issues that could present hurdles to completing a farm bill, one has gained particular attention thanks to a recent public dispute that was punctuated by Senator Grassley’s (R-IA) lone vote against the farm bill in the Senate Ag Committee: eligibility requirements for, and limits on, farm program payments (Sarlin, June 5, 2018; Anderson, May 30, 2018. This seemingly esoteric issue is traditionally one of the toughest to sort out in a farm bill debate. It tends to have particular resonance on the House and Senate floors where perspectives outside of the agricultural sector weigh heaviest. It is often one of the final matters resolved in conference. As the farm bill moves to the Senate floor and the House possibly moves to reconsider its version, this article reviews this particular issue further with some historical background, the specific changes proposed, and some political context. Controversy has long enveloped federal commodities support, beginning with the first payments made to farmers by the Agricultural Adjustment Act of 1933. In 1936, Secretary of Agriculture Henry A. Wallace was forced by Congress to publish a list of payments under the AAA which revealed that one farm entity had received $318,000 in government payments in the first three crop years of the 1933 AAA (Nelson, 1974). That farm entity was the Delta & Pine Land Company, the nation’s largest cotton plantation. The controversy was magnified by the fact that a majority of its stock was owned by a British cotton textile corporation and the farm was managed by Oscar Johnston. Mr. Johnston, a lawyer, banker, and politician in addition to managing the cotton plantation, was also the finance director of the Agricultural Adjustment Administration that implemented the programs and made the payments. He also managed the Federal Cotton Producer’s Pool and served as director and vice-president of the Commodity Credit Corporation. This glaring conflict of interest and the size of the federal payments his operation received provided political fodder for opponents of farm support policy, complicating Congressional efforts to resuscitate the policy in 1936 after the Supreme Court had struck it down. First, H.R. 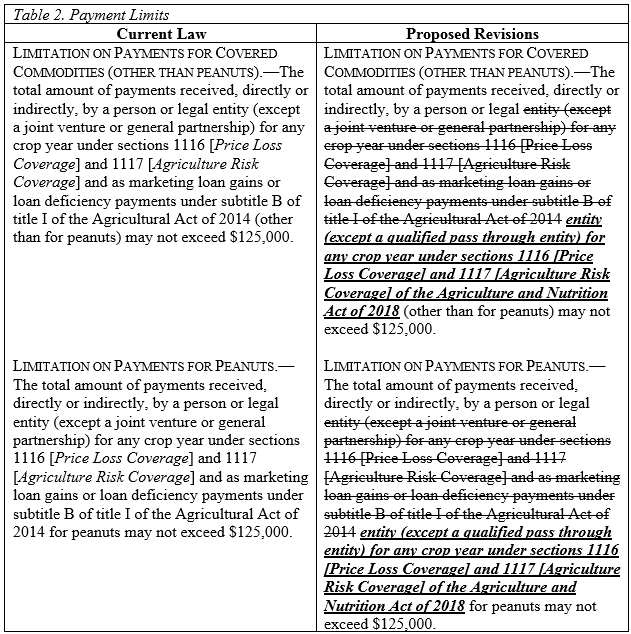 2 proposes to revise the definitions applicable to farm program payment limits and eligibility requirements. It would add cousins, nieces, and nephews to the current list of those individuals who can be considered a member of the farm operation. 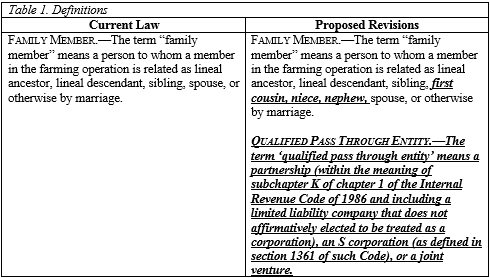 It also adds a new term for a “Qualified Pass Through Entity” farm operation that is based on the tax code. Adding family members would permit farm operations to increase the total payments received; each new family member would bring with them the potential for another $125,000 in payments. The impact of adding qualified pass through entities will be discussed further below. A key component of the payment limit issue are the differences in payments for each of the covered commodities. Farm program payments are made using historic base acres that are decoupled from the actual planting of the crop; payments are made on base regardless if the crop associated with the base was planted. Moreover, payments are made on 85 percent of the total base acres for the crop, known as payment acres. Figure 1 estimates payments per payment acre for each of the main covered commodities, using the total direct cash payments in the Congressional Budget Office Baseline (CBO April 2018 Baseline). Note that CBO has not provided an estimate of seed cotton base used for the new program and the calculations in Figure 1 estimate seed cotton base at 80 percent of the total generic base acres, which were former upland cotton base acres (for more information on this issue, see farmdoc daily, February 14, 2018). In terms of payment limits, the larger the payments, the fewer acres it takes to reach the limit. 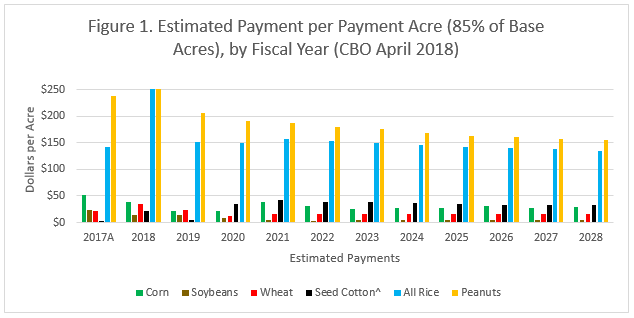 Figure 2 uses the average of the estimated payments per payment acre in Figure 1 for fiscal years 2019 through 2028 to calculate the estimated number of acres at which the payment limit becomes binding. For example, soybeans have an average estimated payment per payment acre of $6 and it would take over 20,000 soybean payment acres to reach the cap. By comparison, rice averages $146 per payment acre and would only require 854 payment acres to reach the limit. If a farmer has corn, soybean, and wheat base the total payments for all three crops are subject to that single limit. If the farmer also has peanut base, a separate $125,000 for just peanut payments applies; note that peanuts at $174 per payment acre would need only 718 payment acres to reach the separate payment limit provided. H.R. 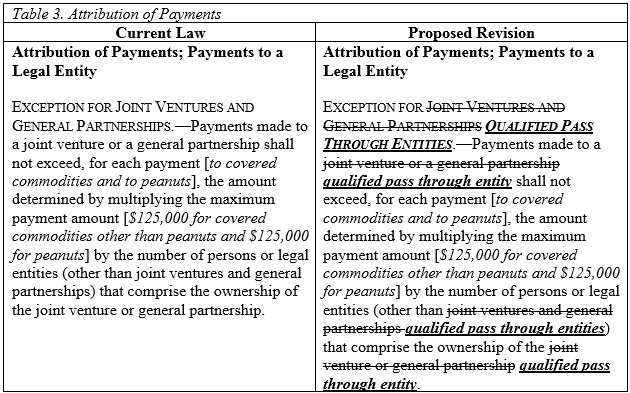 2 proposes to open this exception to cover all qualified pass through entities rather than just joint ventures and general partnerships. If a farm operation is a sole proprietorship, it can only receive one payment limit for all commodities other than peanuts and a separate limit for peanut base. As proposed by H.R. 2, if that same farm operation reorganizes as a qualified pass through entity, it can increase the total amount of payments for each person or legal entity it adds to the operation. Nelson, L.J., “Oscar Johnston, the New Deal, and the Cotton Subsidy Payments Controversey, 1936-1937,” The Journal of Southern History, Vol. 40, No. 3 (Aug. 1974), pp. 399-416. U.S. Government Accountability Office, “Information on Payments [Reissued with Revisions],” GAO-18-384R, June 5, 2018, https://www.gao.gov/products/GAO-18-384R.